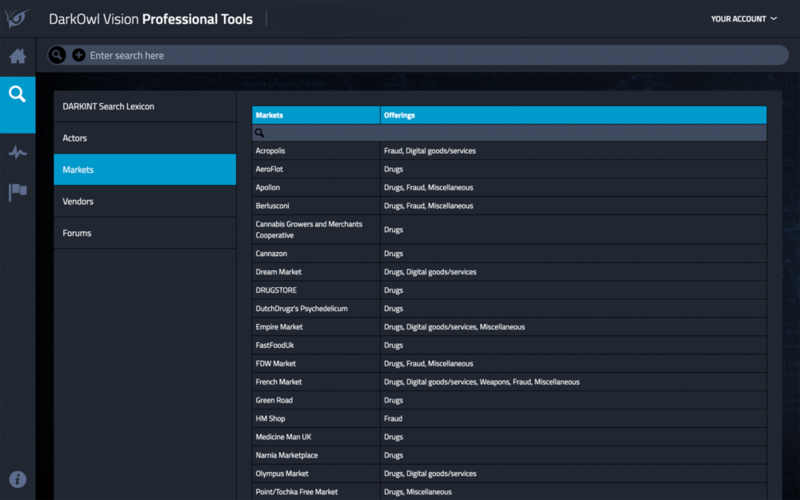 Easily discover and search for threat actors, darknet marketplaces and more. DarkOwl Vision's new DARKINT Search Lexicon is an easy-to-use tool intended to help users find interesting content within our database. Navigate through categories such as "Vendors" or "Actors" to build queries that will search for well-known darknet vendors or threat actors. Narrow down categories by searching for a particular topic within the Lexicon to find the results that are most relevant to you. Then, simply click on the item you'd like and the query will auto-populate in the search bar, allowing users to build queries like a pro and explore even more content in our database. We're counting on you to make our Lexicon even better! Make a suggestion for content you'd like us to add using the form below. Please submit content that you think should be included in our Lexicon, including suggestions for new categories. Thank you for your submission to our DarkOwl Lexicon! The DarkOwl Lexicon will only continue to grow and become more comprehensive as we add more content. So, if you know of a prominent threat actor that's not in the "Actors" list, or you've heard of a darknet marketplace that doesn't appear in "Markets" - we want to know about it!